Despite decades of research, rosacea still garners considerable mystery in the dermatology world. Why does the ‘rosy glow’ of pre-rosacea often advance to long-lasting bouts of flushing with masses of broken blood vessels clustered across the facial skin? Why does facial flushing occur more often and last longer in the more advanced stages of rosacea? Why do these same vessels often become fragile, break and form telangiectasia? Can we stop or even reverse the damaging affects of rosacea on facial blood vessels? Can we restore vascular health and homeostasis to the facial vascular system… and protect rosacea-affected blood vessels from future damage and dysfunction? For many rosacea sufferers, the answer is “Yes” — we can reverse most of the physical damage, hyper-responsiveness and even protect blood vessels from inflammatory insults. Although the exact cellular reasons are not yet fully understood, recent scientific and clinical research indicate that vascular hardening, hyper-responsiveness and telangiectasia are primarily caused by damage to the collagen and elastin layers in the middle of the blood vessel wall. Over time, chronic inflammation in the facial skin adversely affects rosacea-prone blood vessels. Blood vessels are often subject to inflammatory substances flowing through the blood stream and inflammatory substances produced by adjacent skin cells — these inflammatory substances often enter the blood vessel walls through pores, ducts and gap junctions. These inflammatory substances can be blocked and scavenged up to a certain point, but when the vasculo-protective mechanisms are over-run by inflammatory peptides and immune cells, it triggers a chronic inflammatory response within the blood vessel wall that results in substantial damage to collagen and elastin fibers throughout the blood vessel wall. Collagen and elastin are responsible for the strength, support and constriction of blood vessels and thus damage to these important vascular components allows blood vessels to dilate much easier, enables the blood vessel to open up much wider, and makes these vessels quite fragile… often leading to breakage of the vessel wall (telangiectasia). In addition, when collagen and elastin become inflamed beyond a certain point, they harden and crystalize; this leads to internal hardening of blood vessels and after this happens, blood vessels stay open for long periods of time — resulting in more intense flushing of extended duration — and these vessels no longer possess the healthy collagen and elastin fibers that account for vascular elasticity and thus are unable to constrict back to normal diameters. This becomes a vicious cycle for many rosacea sufferers and often leads to progression of rosacea, stronger rosacea triggers and often results in new triggers. During the rosacea inflammatory process, the enzymes collagenase  and elastase  are released from skin cells, diffuse to nearby blood vessels and damage collagen and elastin within the vascular wall. Another damaging enzyme is hyaluronidase , a mucopolysaccharide-splitting enzyme that causes enlargement of vascular pores, increased permeability of blood vessels and eventual breakage. Matrix Metalloproteinases , a major target for rosacea treatment (e.g. Oracea®) due to their pro-inflammatory actions and destructive nature to blood vessel walls that eventually causes vascular hardening and fragility if left unchecked. The Mediterranean olive tree (Olea europaea) produces one of the most unique skin-specific anti-inflammatory fruit extracts yet discovered –Oleuropein — a patented olive pulp extract from a select Italian variety of olives particularly rich in polyphenols, bioflavonoids, antioxidants and skin-beautifying biochemicals. This unique beneficial olive fruit extract is eaten every day in the Mediterranean thanks to the the Mediterranean diet which includes generous amounts of olives. The is one of the primary reasons for the stereotypically flawless Mediterranean complexions that are found in this area of the world (…obviously genetics also plays a factor in this skin type too…). Oleuropein is obtained through an innovative water extraction procedure that does not use harsh solvents, alcohols or high heat. This allows high levels of Oleuropein extraction from the olive fruit pulp (from 3% in most supplements currently on the market to 15% in Rosadyn’s proprietary blend), maintains high bioavailability, and does not denature the extract which results in extremely high bioactivity once the Oleuropein reaches the skin’s cells… ultimately the most important factor to consider with any oral treatment. Oleuropein, along with its important cofactors (verbascoside, catechins and hydroxytyrosol) have strong anti-inflammatory actions throughout the dermis and epidermis, stimulate cellular regeneration of damaged cells such as collagen and elastin due to their unique binding attraction to glycoproteins on these fibers, suppresses vascular hardening and allows regeneration of the tight collagen-elastin helixes throughout blood vessels — allowing them to attenuate dilator responses and constrict back to normal diameter after vasodilation. In essence, these important vasoactive fibers act like tethers to limit dilator responses, maintain a healthy tone, and add substantial strength and durability to all vessel types throughout the facial skin. Hyaluronidase Inhibition — Oleuropein and Catechin block Hyaluronidase activity. This protects the “glue” that bonds collagen and elastin together in tight helixes. It also protects hyaluronic acid, a basic constituent of connective tissues and one of the best naturally produced moisturizers — thus, giving olive fruit extract its ability to hydrate skin from the inside-out. Matrix Metalloproteinases (MMP’s) — In scientific and animal studies, Oleuropein is a potent blocker of several MMP’s that are known to play important roles in rosacea inflammation and vascular breakdown. These studies suggest that at clinical doses, like those used in Rosadyn, oral Oleuropein is a more effective blocker of MMP’s than Oracea®. At clinical doses, Mediterranean Olive Fruit Extract with high concentrations of Oleuropein (15%) is a superb anti-inflammatory for rosacea skin which boasts one of the most effective vasculo-protective actions and the unique ability to rebuild collagen and elastin, and fortify rosacea-affected blood vessels. 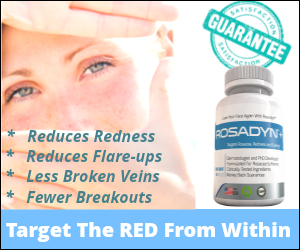 This is a must-have nutraceutical for all rosacea sufferers.